Measurements: Giggle is 9½in (24cm) tall to top of head when standing, and 8in (20cm) tall when sitting. Likkle Piggle is 4in (10cm) tall to top of head. Giggle: Of Hayfield Bonus DK 100g balls: 36g in Peaches 888, 20g in White 961; 14g in Royal 979 and 12g in Primrose 957; of Sublime Baby Cashmere Merino Silk DK 50g balls: 6g in Piglet 001; 2g oddment of green DK yarn; 1yd (1m) lengths of black and dusky pink DK yarn; pair each of 2¼mm (no.13) and 3mm (no.11) knitting needles; set of four 2¼mm (no.13) double-ended needles; 60g washable toy stuffing; two ½in (12mm) diameter cherry red buttons; three small plastic press fasteners; 10¼in (26cm) of ½in (12mm) wide elastic; cherry red, pale yellow and white sewing threads; pink pencil; long tweezers. 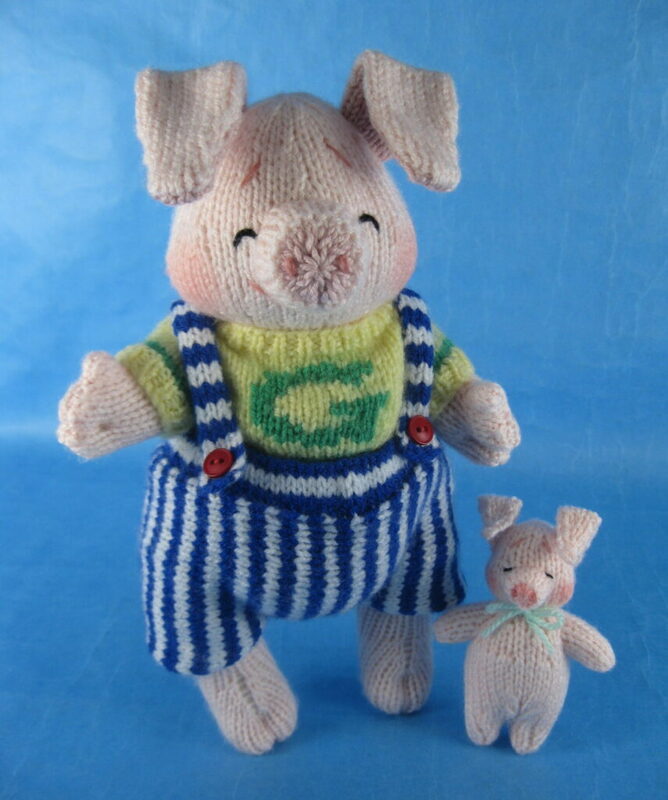 Likkle Piggle: Of Hayfield Bonus DK 100g balls: 8g in Peaches 888; 18in (50cm) lengths of pale green, black and dusky pink DK yarn; pair of 3mm (no.11) knitting needles; 6g washable toy stuffing; fabric glue; pink pencil; long tweezers.